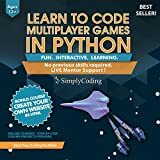 DESIGN A MULTIPLAYER GAME: Simply Coding Python-Multiplayer teaches how to create a client that will connect both to a local server (they'll have all the raw files that make the server work) and to connect to a server hosted live on the web! This course uses step-by-step, easy-to-follow programming instructions that let them challenge friends with fun, age-appropriate computer games they made themselves! PC, MAC & LINUX: Our programs offer extended platform support and reduced system requirements so everyone can enjoy programming. Just access our online course via the registration code, create an account, and use our videos and tutorials to start learning how to create multiplayer games with Python. Expand your son's or daughter's working knowledge of science, math and the python computer language with a school board approved programming curriculum for kids! Kids all over the planet absolutely love video games, especially space adventures they get to play with friends. Now, thanks to Simply Coding courses, your child will get to play two unique adventure computer games that they get to create all on their own! Designed by advanced programming experts, our course teaches your child exactly how to build, play and share their multiplayer, Python-based adventure games. Featuring guided instructions that build up their math and science skills while teaching them valuable coding skills that eventually become high-marketable job skills, the Python - Multiplayer is the perfect challenge for children with dreams of making their own computer games in the future. ATTENTION: Each box contains a registration code with access to our online class. Register your code by visiting our website and creating an account, and you'll receive exclusive access to online videos and tutorials. Your children will never know they're learning valuable computer science and math when they're creating their own adventure games! Click 'Add to Cart' now to help them learn a valuable skill while having a blast with friends.